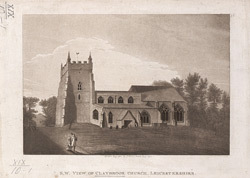 View of St Peter’s Church in Claybrook Parva, Leicestershire. Claybrook Parva and Claybrook Magna are situated in south west Leicestershire, Claybrook Magna is the larger of the two villages which together are often known as the Claybrooks. The oldest parts of the church date from the Anglo Saxon period however much of St Peter’s was rebuilt in the late 13th and early 14th century. It has a square tower which houses eight bells. The chancel, which was built in 1340, has been designed in a much more extravagant style than the remainder of the church.